Surface: Gold Matte on Top, Blue on Bottom. This is a unique Taiyo Yuden CD-R, exclusive to www.LDBMART.com. The top surface of this TY Gold disc is gold matte, so it offers protection from fingerprints and other top surface damage. It has the same Cyanine dye that all Taiyo Yuden CDs use, offering great archive life and recording. 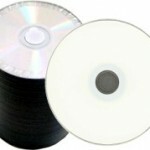 No other CD-R media can deliver the same great performance in your recording drives and in your client’s read drives. 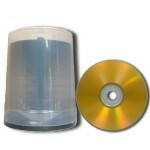 These disc are also some of the few 74 minute CDR discs available. The defacto standard has become 80 minute, but the original “red-book” digital audio standard is 74 minute. We have many professional audio users which swear by the quality of these discs. If you are looking for the finest quality audio discs for your important projects then give these Taiyo Yuden Gold CD-Rs a try. The only discs still made in Japan, these have a gold matte CD-R top surface and Taiyo’s own Cyanine (green/blue) dye recording surface. It has a maximum recording speed of 52x and is packaged in 100 pc cake box/spindles. 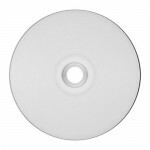 Developed to be silk screened or printed with a thermal printer, this disc is compatible with the Rimage Prism disc printers. TAIYO YUDEN DVD+R, 8X, WHITE INKJET HUB PRINTABLE, 600 PCS/CASE. MIN ORDER: 100 PCS, INCREMENT OF 100. To get free quote call us on our toll free number. TAIYO YUDEN DVD-R, 8X,4.7GB, WHITE THERMO EVEREST PRINTABLE, 600 PCS/CASE. MIN ORDER: 100 PCS, INCREMENT OF 100. For free quote call us. 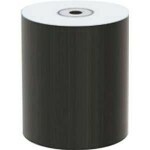 TAIYO YUDEN DVD-R, WHITE THERMO EVEREST PRINTABLE, 8X, 4.7GB, THE PREMIERE BRAND IN THE MARKET, 100 PCS/SPINDLE, 600 PCS/CASE. MIN ORDER: 100 PCS, INCREMENTS OF 100. 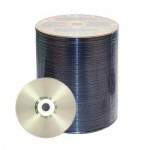 TAIYO YUDEN DVD-R SILVER LACQUER,4.7GB,16X, PN# DVD-R47ZZSB16, 300 PCS/CS. MIN ORDER: 300 PCS, INCREMENTS OF 300 PCS. For free quote call us. TAIYO YUDEN DVD-R,4.7GB,8X, SILVER LACQUER, 300 PCS/CASE. MIN ORDER 300 PCS. INCREMENTS OF 300. 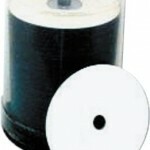 TAIYO YUDEN DVD-R, VALUE LINE, 4.7GB, 8X, SILVER LACQUER, 50 PCS/SPINDLE,300 PCS/CASE. Taiyo Yuden’s Thermal/Everest Hub Printable CD-R media is certified for your duplicator. Comes in a smooth white finish for sharp, professional-grade printing. Hub printable with no top stacking ring, can print within 5mm of center hole.